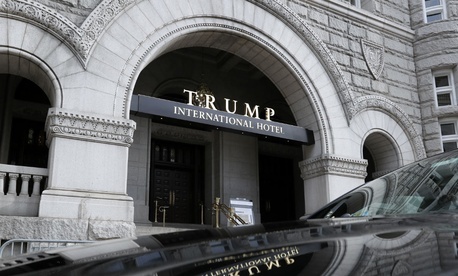 After months of virtual silence amidst public controversy, the General Services Administration on Wednesday handed President Trump a major ethics victory by finding no problems with his three-year-old lease arrangement for the luxury hotel he opened in Washington’s Old Post Office. Terry presented Trump’s family with the Estoppel certificate, the document that gives third parties critical information on the relationship between landlords and tenant. Critics of Trump’s arrangement for the hotel lease he won from GSA in 2013 argued that as president, he could not legally be owner and tenant of a federal property. Trump separately has declared that he will forward all profits earned from foreign government guests staying in the hotel to the U.S. treasury. “Not only is the conclusion unexpected and unpersuasive, as a matter of law, but, as a matter of policy, it is harmful to the integrity - and thus credibility - of GSA, the presidency, and the federal procurement process,” Steven Schooner, a George Washington University procurement law professor and former Office of Management and Budget staffer, told Government Executive.